If it's as hot where you are as it is where I am, you'll appreciate this week's easy and refreshing menu. If it's as hot where you are as it is where I am, you'll appreciate this week's easy and refreshing menu. Take advantage of summer tomatoes in both the gazpacho and Caprese salad. The heat may curb your appetite, but it's still important to get your fruits and veggies! Packed with fiber, they'll fill you up without weighing you down. 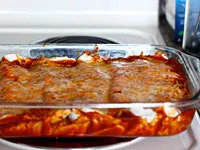 Save the enchiladas for a Friday night get-together with friends—they can be prepared earlier in the day and stashed in the fridge, so all you have to do is pop them in the oven when the time arrives! And don't forget the chips and margaritas! When it's simply too hot to stand in front of the stove, serve this salad in a bowl. Add some sliced avocado and a drizzle of hot sauce for an extra kick! Combine everything in a large bowl. Puree half in a blender and add the remaining vegetable mix to the puree. Season with sea salt to taste and chill for about 3 hours before serving. Serve with country bread topped with goat cheese. Simple to prepare and incredibly refreshing, a Caprese salad never fails to impress guests with its vibrant colors and delicious taste. Serve this when tomatoes are at their absolute peak—if you can find heirlooms, use them! Bring the vinegar to a simmer in a small pot over medium-high heat and let it reduce by half its volume. (This will take about 10 to 15 minutes.) The end result should look almost like chocolate syrup, and it will continue to thicken once off the stove. Arrange the sliced tomatoes on two plates and top with mozzarella slices and fresh basil leaves. 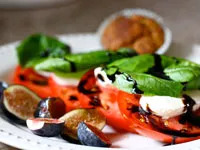 Drizzle the reduced balsamic vinegar over each salad and serve immediately. Serve this Mexican feast with blue corn chips, salsa, and homemade margaritas! Leftovers reheat beautifully. Preheat oven to 425º. Chop the onion and garlic and cook in oil in a pan over low-medium heat for about 10 minutes, or until the onion has started to caramelize. Make sure you don’t burn the garlic! Once this is done, take the mixture off the stove and set aside. Rinse the chicken, and then poach in a large pot of simmering water until done. This will take about 10 minutes or so; be sure to cut through a piece to check if it’s cooked through! Drain the cooked chicken and set aside to cool. Once the chicken has cooled, use your fingers to shred it. Mix the chicken with one and a half cups of enchilada sauce, one cup of cheese, a pinch of cayenne, and the onion and garlic mixture. Stir well to combine. Pour half a can of enchilada sauce in a large glass casserole dish. Fill each flour tortilla with about one-fourth cup of the chicken mixture. Roll up and place seam-side down in the dish and repeat with the remaining tortillas. Once you have filled up the dish completely, pour another cup of enchilada sauce on top and sprinkle with the remaining cup of cheese. Cover loosely with tin foil and bake for 10 minutes. Remove foil and bake for another 10 minutes. Cool and serve with hot sauce, avocado slices, and salsa.